No one conveys emotions better than the rain. Nothing else is so universal; yet so personal like the rain. There is a grandeur about the rain that has made it a compelling subject of great literature, art, movies, and music. Yet there is something that is so common about it that children love to play in the rain. Our hearts swell with joy when we think of childhood experiences of the rain. Nostalgic memories like a heavy downpour flood our emotions at that very thought. For no one misses the first wonder of the rain he felt as a child. Rain is so close to our hearts that “Mazha” (meaning rain in Malayalam) is one of the first words that we learn in childhood. A child, as he watches the rain, soon learns that the cheeks of the clouded skies are but collected teardrops which pour down when too much to hold. So much like a child’s eyes that floods at a moment’s notice and rolls down. And clears when given a toy or a chocolate or a balloon! Ah, then who has not felt the romance of the rain? The chilly winds, the slanting rain, the the murmur, the dark and gathering clouds, the lightning that strikes and the thunder-rolls; all have created magic like nothing else. In that respect rain has been a broad canvas on which rainbow colours of love have often been painted. Though there are scenes in movies that show fights and also the sadness of partings while it is raining; its numbers pale in comparison with the theme of love and romance explored. For some reason that defies logic, the rain is a matter of the heart; like love is. Therefore the absence of rain in nature as well as in human relationships creates anguish. For rain in spite of its occasional fury is a symbol of affection, care and compassion. It nourishes, refreshes, and leaves behind a sense of cleansing as it washes all the dust and debris away. No one can survive long without being an object of such tenderness in human life. Rain is therefore a symbol of hope and new beginnings in life. Moreover, rain so perfectly mirrors our moods: the playful hide and seek of rain and sunshine (“kurukkende kalayanam” as we call it in Malayalam; meaning Fox’s Wedding), the thunderstorms and fiery lightning exposing our frightened thoughts and hiding places, the gentle rain that caresses the cheeks with its lovely dewdrops, the chillness that make us long for companionship; all are intertwined with our lives as well. Or think of the variety of experiences rain gifts us with: a child rushes in to his home to make paper boats to float in the rushing water, another splashes into puddles of water that collects, still others make merry under the comfort of spread umbrellas or by wearing fancy raincoats, some others watch the rain from within a car with all windows up, while some find joy in walking alone in the rain and getting drenched to the skin! These are all experiences that are so much part of our life; aren’t they? It is also difficult to erase the memory of togetherness when someone had walked with a loved one in the rain! These are words of comfort; for God had promised that whenever he sees the rainbow appear in the clouds, he’ll remember us and show us mercy. 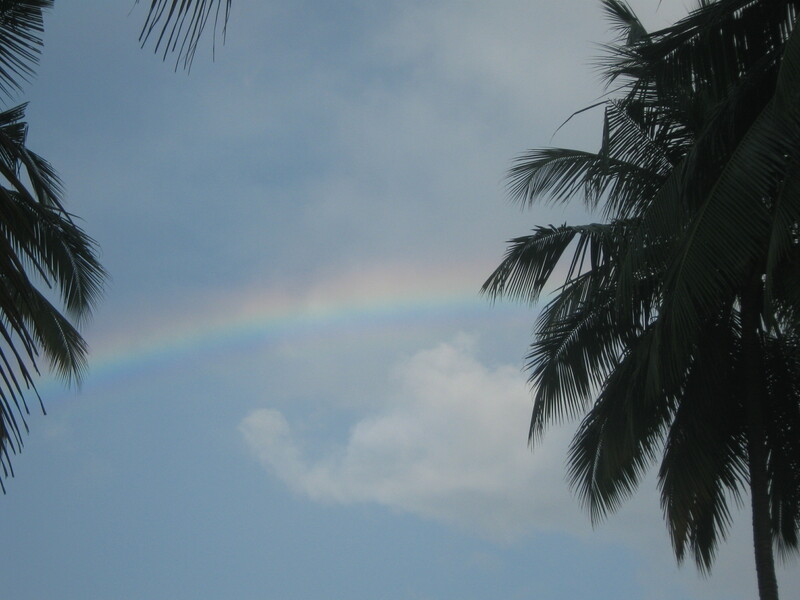 Therefore let rain clouds gather; and let the rainbow appear! Biblical References: Ezekiel 1:28, Genesis 9:12-17. It’s fine look, thanks for good selection. Previous PostPrevious What Was More Valuable: Life or a Sandal? Next PostNext Have You Hid Your Talent?